Filing for bankruptcy is often treated as a cure-all for financial problems, especially if this is something that you have never experienced before. But bankruptcy can have some incredibly difficult consequences, both immediately and over time. In finance, bankruptcy is widely regarded as a “nuclear option.” While bankruptcy may be the best course for you, it is important to make sure that you are considering all aspects of your situation and that you are aware of the effects that it can have on you and your family. Bankruptcy immediately impacts your credit and credit score. In essence, you are acknowledging that you can no longer pay your debts, which will have a negative effect on your FICO score. If you had spotless credit before filing bankruptcy, you will see a dramatic drop in your score. However, if you had several negative items on your report before filing, you will see a modest drop in your score. If you are in dire financial trouble, filing bankruptcy will ease your short-term debt burden by getting creditors off your back. In most bankruptcy cases, the courts will assign a trustee who determines which assets you can keep and which assets you must sell. Depending on the type of bankruptcy that you file for, you may be able to keep some of your assets or you may be forced to liquidate all of them to pay off as much of your debt as possible. 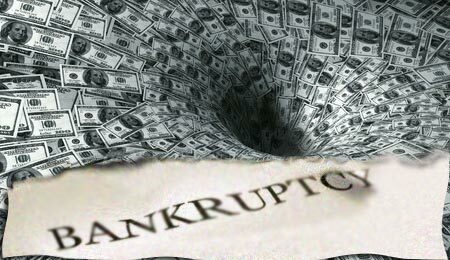 A bankruptcy will remain on your credit report for 7-10 years. The length of time depends on whether you file for chapter 7 or chapter 13 bankruptcy. During this time period, it will be very difficult for you to qualify for new loans or credit cards. If you do manage to qualify, you will have high-interest rates and the terms will be very strict. In addition to affecting your ability to get a loan, bankruptcy has a significant effect on your ability to buy or rent a home. The Federal Housing Administration requires a one-year waiting period before you can apply for a mortgage after you file for bankruptcy. Some companies, such as Fannie Mae or Freddie Mac, will not allow you to apply for a mortgage they back for two years after the date you filed bankruptcy. If a landlord does rent to you despite your bankruptcy, he or she may require a higher than average security deposit. If you are considering bankruptcy, keep in mind that it affects every aspect of your life. Bankruptcy will appear on any background checks that future employers may conduct, which may affect their perception of you. It is important to make sure that you consider all your options before filing for bankruptcy. Sit down with a financial advisor and a bankruptcy lawyer who can assist you in making a plan to protect your family and resolve your debt problems. These professionals can provide a better understanding and help you plan to mitigate consequences and get your life back on track.